Salema’s narrow single street, lined with white-stucco homes, rose steeply from the beach dotted with fishing boat, friendly fisherman's always offering a smile. In Simple and Sunny Salema life passes at a slow and easy pace in Salema. Each morning, the fishermen push their small craft with a tractor over the beach and head out into the mild Atlantic, veering west to parallel the coast and set their nets. The beach beckons at an early hour and it's not hard to find the perfect location near the cliffs to spread the towels and settle in for a perfect day of lounging. Even in October the water temperature is perfect, and Salema’s south-facing beach sits between golden cliffs at either end. The village street winds up the cliff on the eastern end of the beach and the Atlantico seems to serve as the dividing line between the tourist beach and the working beach of the fishermen. Portugal’s Algarve coast stretches approximately 150 miles from the Spanish border, westward to Sagres at "Land’s End." Salema sits approximately 15 miles east of this westernmost point. With almost every pretty beach now being dominated by high-rise condos, similar to Spain’s Costa del Sol. Salema is still an exception to that rule, and its relatively small beach will certainly limit the development. If you’ve ever planned to visit the Portuguese coast, Salema is still a magic slice of the Algarve. It’s a great place for a "vacation within a vacation." 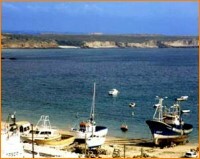 The nearest town is Sagres located to the west. Also to west is Vila do Bispo that acts as the administrative centre for the area and also houses a few good fish restaurants. In the 8th Century about one kilometre to the southwest of this town was the seat of a religious Order known as the Igreja de Corvo. Founded by Christians from Valencia seeking refuge from the persecution of the Spanish ruler Abderramão I, all visual traces have been removed in the course of time. However, in the immediate vicinity are over 250 “megaliths” and other signs of ancient civilization dating back thousands of years. The area was recorded by the Moors as being very rich and providing hospitality to all travellers regardless of their faith. From Sagres the traveller can either go north or back to the east. Along the south coast just to the east is the superb open beach of Martinhal that is popular with windsurfers. Further east are the small and unspoilt beaches of Ingrina and Zavial, whilst further on is the more developed beach of Salema. Just to the east of Vila do Bispo near the small village of Raposeira is the modest 13th Century Chapel of Nossa Senhora de Guadalupe, reputed to have been used often by Dom Afonso Henrique in his religious devotion. The beaches immediately to the north of the Cape are more exposed to the winds and rollers of the Atlantic with quite dangerous offshore currents. 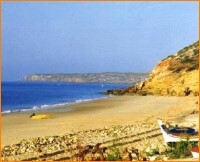 Further to the north of Vila do Bispo is the open sandy beach of Bordeira. 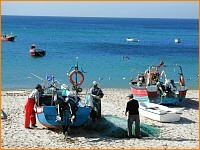 About two-thirds of the journey north to this beach is a turning left to the small village of Pedralva. The village is now nearly completely unoccupied but it shows to the traveller a picture of what the Algarve looked like prior to the invasion of tourism and how life was once very demanding.